How did you get the idea for the article? What drew you to the story? I contacted some missionaries I know there and asked if I could spend a few days with them seeing their work. They told me they were involved in ministry to refugees from Pakistan, and I said I definitely wanted to experience that work firsthand. A lot of my recent stories deal with churches serving refugees (in Europe, the U.S., Africa, etc.) in various ways. So, my final afternoon in Bangkok, I visited some of the refugees with the missionaries and basically just sat there and heard their stories. The package really wrote itself from there. Describe your process of gathering material for the article. I did almost everything for this story on-site with in-person interviews. Honestly, I didn’t even ask that many questions. I just let them tell me their stories. I later researched the plight of refugees in Thailand and contacted a representative of a human rights group to get a few “big picture” quotes. How did you acquire engaging photos for the story? I shot a few photos in person. I didn’t want to be intrusive but I thought it was important to share with our readers what the refugees’ living conditions are like. The missionaries later shared with me one of the photos I used on the inside jump and another taken at a jail after some of the refugees were arrested. What was the most difficult part of getting the story/photo package ready for publication? The refugees were eager for me to share their stories and were bold about sharing their plight and their faith. But the missionaries and I had some concerns for their security and privacy. I consulted with the missionaries throughout the writing process to make sure I was telling the story in a way that was accurate—and in a way that would be sensitive to those concerns. What did you learn from working on this story? It was a powerful experience—probably the most powerful I’ve had in 15 years of work with The Christian Chronicle. I actually broke down at one point (that rarely happens) when one of the refugees told me how thankful she was for the hardships she’s faced because they make her aware of her utter reliance on God. I pray for that kind of faith. 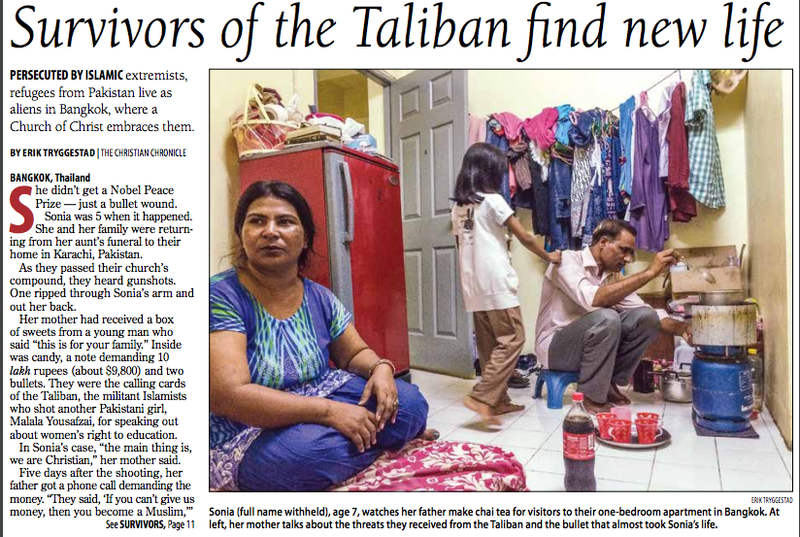 The Christian Chronicle (an international newspaper for Churches of Christ) won the Associated Church Press Best in Class/Award of Excellence in the Print: National or International Newspaper in 2016 for this story.